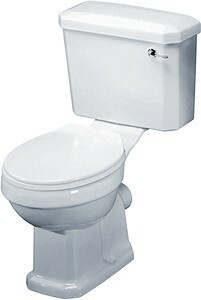 Crown Ceramics > Carlton Traditional Toilet With Cistern & Seat. Carlton traditional toilet with cistern, fittings and seat. Size 470W x 690D x 820H mm. Close coupled toilet with horizontal waste outlet. Size 470W x 690D x 820H mm. Cistern with chrome lever handle flush. 5 Year guarantee: Crown guarantee this Carlton toilet for 5 years.